CA-BDU-#RiverFire [final] east of Lone Pine (Inyo County) is now 406 acres & 100%. 02-28-13 1800 hrs #RiverFire [final] east of Lone Pine (Inyo County) is now 406 acres & 100% contained. 02-28-13 1300 hrs Fire has burned 408 acres of Salt grass and Cottonwood trees and is 90 Percent contained. Access to areas of the fire were difficult due to river bottom conditions/marshlands, gusting winds and smoldering heavy fuel on the interior of the burn, due to the long and narrow pattern of the burn. Firefighters Continue to mop up and patrol the perimeter. 02-26-13 River Fire CA-BDU-002372 Inyo County, East of Lone Pine, The wildfire burned 406 acres of Salt grass and Cottonwood trees so far and is 75% contained. Values at risk: power lines and livestock, Significant demob to begin today. CARRU- #JurupaFire 311 acres, 40% cont., winds calm. 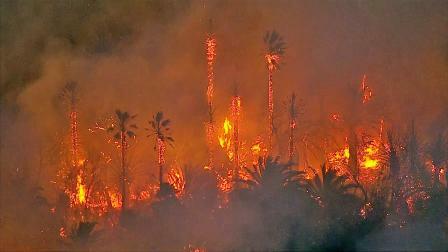 Official Update 3-2-13 1830 hrs: Riverside County: CARRU- #JurupaFire 100% contained @ 311 acres. Official Update 21:45 hrs. : 9:45 p.m. 150 acres, 20% cont. day shift tomorrow, 1,846 Riverside City residents are without power. Mandatory evacuations on Greenbrier Drive and Grassy Trail in the CITY of Riverside. Evacuation site by Riverside City at Nichols Park located at 5505 Dewey Ave.
Brush fire is seen in a riverbed in Jurupa Valley on Thursday, Feb. 28, 2013. Current Situation: Update 7:30 p.m. Fire is now 20% contained, winds are calm. No estimation on full containment or control. Update 6:50 p.m. Fire is now 50-75 acres. Mandatory evacuations on Greenbrier Drive and Grassy Trail in the CITY of Riverside. Evacuation site by Riverside City at Nichols Park located at 5505 Dewey Ave. Orange County Fire Authority also assisting. Captain Lucas Spelman is the Fire Information Officer assigned and is on scene at Rio Road and Calle Hermosa. Additional updates will be posted as information becomes available. Update 5:45 p.m. Murrieta Fire Protection District, Morongo Fire Department and Pechanga Fire Department also assisting. Fire is 50 acres. CAL FIRE/Riverside County Firefighters along with assistance from Riverside City and Corona City fire are working to extinguish a vegetation fire in the Santa Ana riverbottom. Powerlines are also down in the area. The fire is approximately 10 acres in size burning in heavy fuels. Updates will be posted as information becomes available. SALEM -- A legislative committee has passed a bill that frees up the Oregon Department of Forestry to deploy resources for keeping small fires from becoming large ones. House Bill 2050 also would split the cost of fighting large-scale wildfires evenly between forest landowners and the state. The bill's centerpiece is a provision allowing the state to use $5 million from its Forestland Protection Fund for initial attack on small fires. Under existing policy, only $2 million from the fund can be used for initial attack. The funds would be used to deploy equipment and fire fighters in staging areas in advance of a fire when lightning strikes are predicted in an area. "Our goal is to have 97 percent of all our fires controlled at less than 10 acres," state Forester Doug Decker said. Decker said a coalition of diverse interests worked for two years to develop the concepts behind the bill. Small woodland owners, large-scale timber operations, conservationists and others testified in support of the bill in a hearing Feb. 28 before the House Agriculture Committee. "House Bill 2050, I believe, will give the department the resources it needs to keep fire-fighting costs down by reducing the size of the catastrophic fires in Eastern Oregon," testified Lyle Defrees, a Baker County rancher and woodlot owner. The bill calls for landowners to pay an additional $3 million into the state's Forestland Protection Fund with the promise that under a six-year phase schedule, landowner costs eventually would decline as the state and private landowners evenly split the cost of fight large-scale wildfires. Under existing policy, landowners pay the first $10 million of the annual costs of fighting large-scale wildfires through assessments on private forest acreage, a harvest tax on forest products and a surcharge on improved lots. The state pays the next $15 million, if needed, for fighting large-scale fires, before an insurance policy kicks in. The formula has resulted in landowners paying the lion's share of the costs. Since 1993, landowners have paid out $156.8 million for fighting wildfires, while the state has paid $34.1 million, said Kristina McNitt, executive director of the Oregon Forest Industries Council. Not since 2002 has the state run through the entire $25 million in the fund and used its wildfire protection insurance policy. The Agriculture Committee moved the bill with a do-pass recommendation to the joint Ways and Means Committee. CHEYENNE, Wyo. – The U.S. Forest Service will award long-delayed contracts to add several large, jet-powered air tankers to the nation’s fleet of firefighting planes in about two months, U.S. Forest Service Chief Tom Tidwell said Friday. The next-generation air tankers are required to be able to cruise at more than 340 mph while fully loaded with no less than 3,000 gallons of fire retardant. The planes are sorely needed – the fleet has dwindled to 11 from 44 a decade ago. Contracts for the air tankers were on track to be awarded last year. The Forest Service announced in June that it was contracting four companies to fly seven of the new planes to fight fires. President Barack Obama budgeted $24 million for that purpose. Last year’s announcement came as an already fierce wildfire season was just getting started. Before the month was out, the Waldo Canyon fire had roared into Colorado Springs, killing two people and destroying more than 340 homes. Then in October, protests filed by companies that didn’t win air tanker contracts – Canada-based Coulson Aviation and 10 Tanker of Victorville, Calif. – prompted the Forest Service to reopen the bidding process for the next generation planes. Tidwell said contracts now are on track to be awarded about 60 days from now. “One way or another, we’ll have an adequate large air tanker response this year,” he said. As many as seven next-generation large air tankers could be contracted, according to the Forest Service. The air tankers contracted by the Forest Service don’t attempt to put out wildfires. Rather, they drop fire retardant around the perimeters of fires to slow their spread. That buys time for firefighters to move in on the ground and for other types of aircraft to drop water on the flames. Nine of the Forest Service’s 11 planes are Korean War-vintage P2Vs operated by Missoula-based Neptune Aviation. Neptune also has been under contract to operate two BAe-146 jets, which meet the next-generation requirements. Neptune was among the companies that were to receive the next-generation contracts. The other three were Minden Air Corp. of Minden, Nev.; Aero Air LLC of Hillsboro, Ore.; and Aero Flite Inc. of Kingman, Ariz. The Forest Service responded to the protests by making a number of fairly technical changes to the contract terms for the latest bidding process, said Bill Gabbert, a former firefighter and wildfire expert who blogs about the air tanker industry on his Wildfire Today website. Large air tankers such as those the Forest Service seeks to add to its fleet play an important role in preventing small wildfires from turning into big ones, Gabbert pointed out. The possibility of still more contract protests that could keep needed air tankers from fighting wildfires alarms Colorado Sen. Mark Udall. “If contractors continue to challenge agency decisions, I will urge the Forest Service to use its emergency authorities to override the challenges and finalize the tanker contracts as soon as possible. Colorado cannot wait,” Udall said in a statement this week. Tidwell said the Forest Service has that option, but also can call upon up as many as eight additional planes if needed. Those are CV-580s operated by the state of Alaska and the Canadian Interagency Fire Centre. The Forest Service also has access to eight military C-130 cargo planes specially fitted to drop fire retardant from a device called the Modular Airborne Firefighting System. The C-130s are operated by Air National Guard and Reserve units in Wyoming, North Carolina, Colorado and California. Dozens of water-dropping helicopters and smaller, single-engine air tankers also are on contract with the Forest Service to fight fires. A dry winter already portends another harsh season for wildfires in the Rocky Mountains. Southern Montana and nearly all of Wyoming, Colorado and New Mexico remain locked in a severe drought, according to the U.S. Drought Monitor. The Forest Service tries to allocate firefighting equipment where it’s likely to be needed most, Tidwell said. “This time of year, we’re looking at where we can expect early fire season to be, where it will move across the country,” he said. “Then, as it moves across the season, to have those resources on board. WILLOWS — Three men had to be rescued by Cal Fire after they were stranded in the Mendocino National Forest for about seven hours Monday.The Glenn County Sheriff's Office received a call from someone who heard people asking for help over the California Department of Forestry's radio frequency, according to the GCSO. Once it was determined they were at the Red Mountain repeater site, Cal Fire was able to get them. The unidentified men, who are in their 20s, were driving in the area when their car got stuck in the snow at about 2 p.m., according to the GCSO. Since they were familiar with the area, they decided to get out of the car and walk. They made a five-mile trek from where they were stranded until they came across the repeater's site, according to the GCSO. They broke down the door and were there until they were rescued at about 9 p.m.
FEMA developed these resource typing and position qualifications definitions in collaboration with emergency management and public safety professionals and subject matter experts. These stakeholders suggested guidance for specific overall functions, components, capabilities, and order specifications for this resource. This guidance addresses requests that are made under a variety of mutual aid scenarios from automatic aid to that implemented in declared disasters through Emergency Management Assistance Compact. Questions can be submitted via e-mail at: FEMA-NIMS@fema.dhs.gov or telephone: (202) 646-3850. This effort is part of the National Preparedness System, a process that organizes the tools and resources needed to move toward achieving the National Preparedness Goal. For more information on national preparedness efforts, visit: www.fema.gov/ppd8. Chief Timothy John McClelland has been charged with vehicular manslaughter with "Gross Negligence"
SAN BERNARDINO, Calif. — The chief of Cal Fire's San Bernardino unit was charged Tuesday, Feb. 26, with vehicular manslaughter with gross negligence in connection with a collision Aug. 1, 2012, in which he rear-ended another vehicle while driving a Cal Fire pickup. Timothy John McClelland, 48, was charged with a misdemeanor count in the death of Gregory Francis Kirwin, 48, of Banning. McClelland is due to be arraigned April 10 in Superior Court in San Bernardino. "It's a tragedy for everyone involved," Cal Fire spokeswoman Julie Hutchinson said. McClelland remains on duty. He has been reassigned to administrative projects in the Southern Region office in Riverside. Hutchinson said Cal Fire won't begin an internal review of the crash until after the legal case concludes. A message left for McClelland seeking comment was not returned. San Bernardino County district attorney's office spokesman Christopher Lee said the court website that lists the charge as a felony is in error. McClelland was driving a white 2005 Cal Fire Chevrolet 1500 east on Highway 210 west of Del Rosa Avenue in Highland when it rear-ended a red 2001 Ford Focus, the CHP said. Kirwin died at the scene. Kirwin's car rear-ended a silver 2003 Chevrolet Impala, the CHP said. At the time, the CHP said, it was unclear which collision happened first. The Impala had been slowing because of traffic congestion, according to the preliminary investigation. The Cal Fire pickup sustained major front-end damage. McClelland and the Impala's driver, Kenneth Bietz, 51, of Yucaipa, suffered only minor injuries, the CHP said. McClelland is a Beaumont resident and a 27-year veteran of Cal Fire. He joined the department in 1985 as a seasonal firefighter in Riverside County and took command in May 2011 of the San Bernardino Unit, which encompasses all of San Bernardino, Inyo and Mono counties, Cal Fire said. Copyright 2013 The Press Enterprise, Inc.
United States Coast Guard canceled a search for a group of missing boaters off the coast of Monterey Tuesday. The agency said a distress call from the missing boat may have been a hoax. The Coast Guard received an emergency call for help on Sunday, a rough day at sea for which severe-weather advisories had been issued. 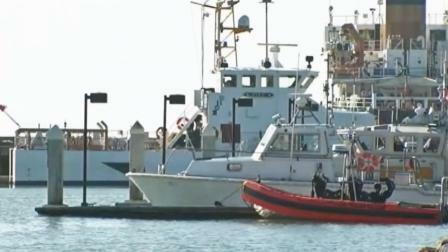 A married couple and two young boys were reportedly on the disabled boat. The man who made the distress call said the boat was taking on water and its onboard electronics were not working, including its vital GPS devices. The distress call said the family was abandoning ship and was preparing to use flotation devices.Authorities think the call may have been a hoax. No families or boats have been reported missing in the days since the distress call was received. Rescuers have been searching the surrounding area by sea and by air. Harbor masters on the coastline from Monterey to Half Moon Bay said No boats Missing. SANTA CRUZ, Calif. (KABC) -- The Coast Guard canceled a search for a group of missing boaters off the coast of Monterey Tuesday. The agency said a distress call from the missing boat may have been a hoax. The Coast Guard received an emergency call for help on Sunday, a rough day at sea for which severe-weather advisories had been issued. A married couple and two young boys were reportedly on the disabled boat. The man who made the distress call said the boat was taking on water and its onboard electronics were not working, including its vital GPS devices. Investigators used a radio signal from the boat and radar and determined the distress call came from about 60 miles west of Monterey. The 29-foot sailboat is thought to be named the "Charmblow." Harbor masters at the string of ports that dot the coastline from Monterey to Half Moon Bay told The Associated Press the same thing: No boats launched from their docks were missing, and no family had disappeared from their community. Neither officials nor boaters had heard of a vessel called "Charmblow." But several noted that boats are registered in California by number, not name. Owners can call a boat whatever they want. Federally registered boats use names, but there was no "Charmblow" listed on the federal database. Coast Guard officials say they're still tallying the rescue efforts' cost but estimate it ran into the hundreds of thousands. The search also included the California Air National Guard. HEMET, Calif. (KABC) -- Financial woes could cost dozens of firefighters their jobs in Hemet. City lawmakers must soon decide whether to outsource fire protection services. "We love our fire department. I pray for them every day. I think they are the best. If they need a raise, we need to give it to them and the police department," said Hemet resident Carla Hecht. For city officials facing a $2.7 million shortfall, it's not raises, but cuts, they are looking at. One solution under consideration is contracting out the city's fire and paramedic services to Riverside County. "We've cut 144 positions, we've furloughed employees, we've cut staff salaries, we've cut programs, we've contracted out several services, including our community center," said Ron Bradley, Hemet's interim city manager. The city also outsources its animal control and trash collection services. But residents say they don't want to see their 115-year-old fire department disbanded to save a few dollars. "The proposals submitted by the county, which I've read, doesn't make sense for Hemet," said Emily McDonough, a Hemet resident who is part of a group questioning the outsourcing proposal and whether it would save money. McDonough said two of the three proposals submitted by Riverside County CAL FIRE cost more than what Hemet's own fire department costs to operate. "The third option, while it is lower in cost, does not meet Hemet's Measure C mandate of reaching service calls within five minutes 80 percent of the time," said McDonough. Whatever the decision, the city says part of any negotiation with the county would include the futures of the 45 firefighters currently employed by the city. NEW YORK — A husband hacked his wife with a meat cleaver on a bustling Chinatown street before firefighters tackled him, police said Monday. Ming Guang Huang, 28, was hospitalized for a psychiatric evaluation after being arrested on attempted murder and other charges, police said. The attack unfolded before witnesses and surveillance cameras on Chinatown's main thoroughfare, authorities said. Firefighters getting their trucks ready for their shifts Sunday heard screams across the street from the firehouse and sprang into action to stop the bloody assault, authorities and witnesses said. It wasn't immediately clear whether Huang had a lawyer or when he would be arraigned, and a message left at a possible phone number for him wasn't immediately returned. His wife was hospitalized; an update on her condition wasn't immediately available Monday. Firefighters Jose Ortiz and James Trainor were working at the Engine Co. 9, Ladder Co. 6 firehouse around 10:20 a.m. Sunday when they heard a ruckus outside and saw the man dragging his wife, crying and screaming, along Canal Street, Ortiz said. As the firefighters started toward the couple, the husband yanked out the knife, Ortiz said. "All of a sudden, I hear the cleaver go up, and he swings down," Ortiz told reporters. "He hit her in the head. ... Now I'm thinking, `I've got to grab this guy.'" Surveillance video appears to show the man slashing at his wife repeatedly as firefighters rush up and pull him off her, pushing him to a fence and then to the ground to subdue him. Meanwhile, the woman whose name hasn't been released dashed off down the street, leaving her shoes and spatters of blood on the sidewalk. "She was running down the street, screaming, `Help!'" Jose Mendez, a 56-year-old building superintendent, told the New York Post. Firefighter Shane Clarke went after the woman while colleagues flagged down police. They caught up to her about two blocks away. "We were trying to get her to stop, but she wouldn't let us get near her" at first, Clarke told reporters. Covered in blood and wounded in her head and abdomen, "she was very panicked," he recalled. She was expected to survive, authorities said. Coffee Break Training: Responsibilities of an Incident Commander. Learning Objective: The student shall be able to describe the responsibilities of an Incident Commander. The Incident Commander is the only position in the Incident Command System that is always filled regardless of the size or complexity of an incident. The IC has the responsibility for the overall management of the incident. Whatever functions or responsibilities that are not delegated to others remain the responsibility of the IC. The engine Company Officer who responds to a call of food on the stove will fill the IC’s position regardless of the local agencies’ routine rank title for that officer. The initial IC’s first responsibility is to assess the situation (size up) to determine the problems, issues or concerns that the crew is confronting. For food on the stove, the initial IC most likely will use an intuitive assessment process — prioritize the problems and develop the objectives, strategies and tactics using a mental process that has come from responding to many incidents of similar types. The IC will then give verbal directions to the engine crew on the work assignments needed to bring this simple incident under control. the IC’s ability to maintain direct control for all the functions on the incident. An experienced IC will recognize early the need to delegate responsibility for many of the functions of command and the overall management of the incident. complexity until the incident is either brought under control or relieved by a more experienced IC. Labels: Coffee Break Training, Incident Commander.